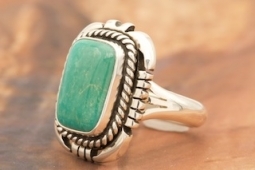 Genuine Fox Turquoise set in Sterling Silver Ring. Created by Navajo Artist Jones Delgarito. Signed by the artist. The Fox Turquoise Mine discovered in the early 1900's, is located in Lander County Nevada.